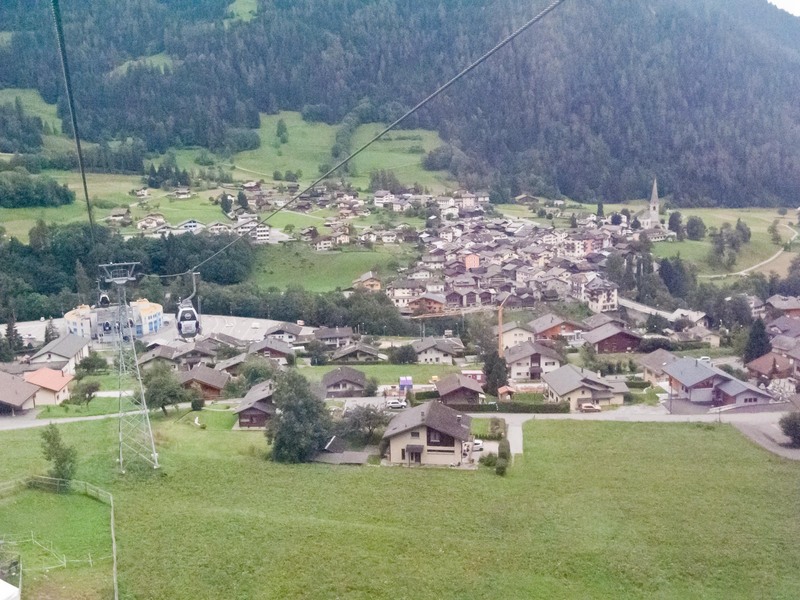 The picturesque little village of Le Chable, Switzerland as seen from the lift up to Verbier. Not much going on today. The place we’re (Jenny and I) are staying at is a rental property that belongs to one of Florence’s friends. They rent it out to tourists, but it was empty this week, so Florence arranged with them to let us stay here for free – pretty good deal. But the owners have tourists coming in today which means that we have to clean up the place and vacate by Noon. 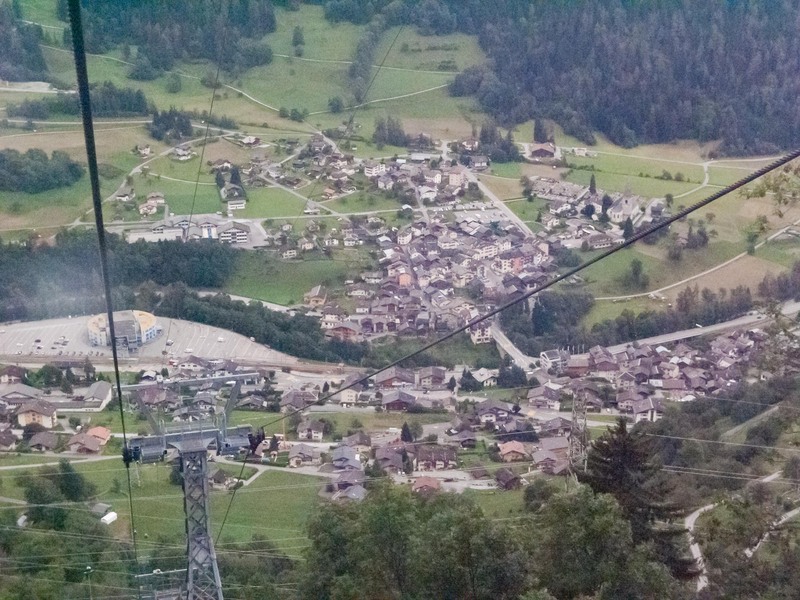 Another view of Le Chable, from a bit higher up on the lift. Verbier is one of the more famous ski resort towns in Switzerland. It's situated about 685 meters (2250 feet) above Le Chable, in the valley bottom. 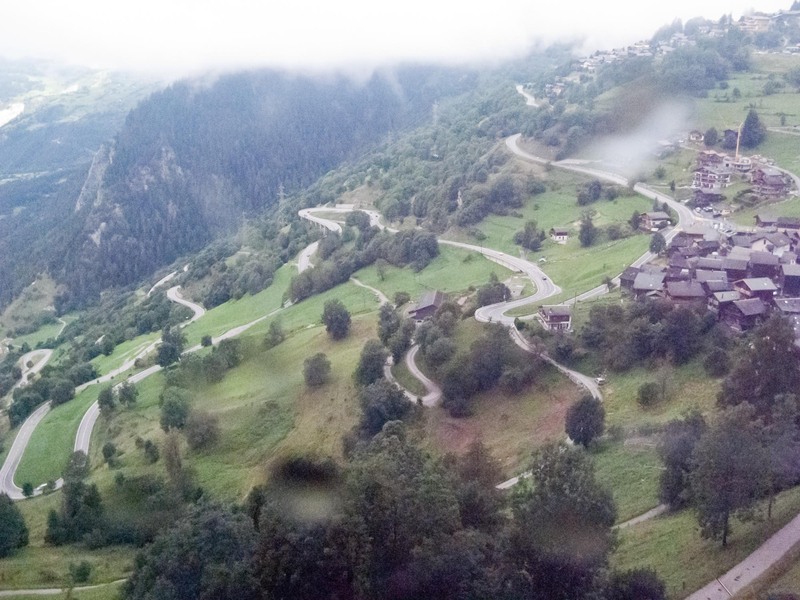 This is the road leading up to Verbier. This being the weekend, Florence didn’t have to work, so the plan was to go do some sightseeing in the area around Le Chable. On the way there, Florence got a call from her Mom requesting help at her brother’s restaurant for a catered lunch party. The three of us dropped in for a bit and Florence served us some very good Swiss white wine that was produced in the local area. I can’t remember the name of it, but I’d sure like to find a way to buy a few bottles of it and have it shipped to Alaska. While Florence was helping with the lunch party, Jenny and I took the tram up to Verbier for an afternoon of sightseeing. Verbier is a ski resort town situated about 2,200 feet above Le Chable. Florence came up to join us around 4:30 pm and we all went to her family’s mountain house up above Verbier for the night. It’s a typical chalet-type house with an open floor plan and a sleeping loft upstairs, all with fantastic views of Verbier, Le Chable and the other villages down in the valley, and the mountains all around – very nice place. Hey buddy, wanna buy a watch? Being an upscale ski resort, Verbier has its share of upscale shopping opportunities. 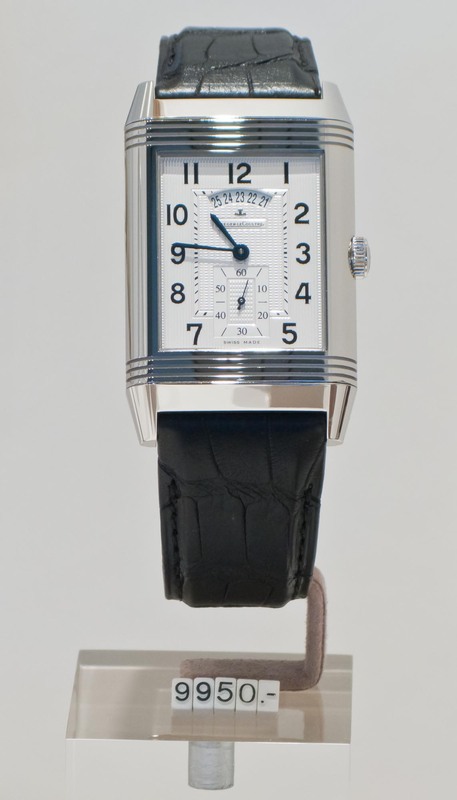 This was the most expensive watch I saw while window browsing. That's 9,950 Swiss Francs, which is about 10,300 U.S. Dollars. Interestingly, this watch was more expensive than several nearby diamond-studded gold Rolex watches. This entry was posted on August 28, 2010 at 4:23 pm and is filed under On the Road, Switzerland. You can follow any responses to this entry through the RSS 2.0 feed. You can leave a response, or trackback from your own site.